The RGB bandwagon shows little signs of slowing down. Monitors, keyboards, mice, chassis, headphones, motherboards, coolers, system RAM, and even SSDs have been given the light fantastic makeover. Some do it better than others and done well RGB adds a touch of panache to what would otherwise be a boring build. The system memory guys have all been busy, with Corsair, G.Skill, GeIL and Crucial all having a multitude of offerings. Newest in line for some RGB pimping is HyperX, who claims its proposition is unique. Intrigued, we sought to find out why by getting a pack in. Part of the existing Predator range, the RGB variant is only available in a 16GB kit comprising of two 8GB modules. 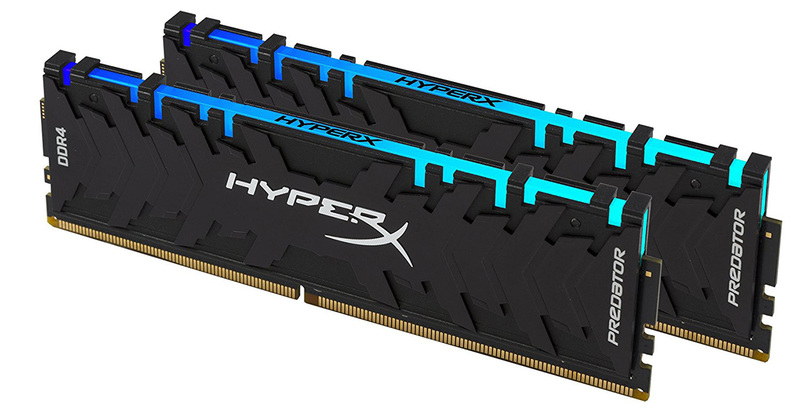 Known as HX429C15PB3AK2/16, the modules are outfitted with XMP 2.0 support at two speeds: DDR4-2666 15-17-17-36 timings and the native DDR4-2933 with almost-identical 15-17-17-39 timings at 1.35V. If you don't bother inputting XMP into the BIOS, the modules run at a default (Jedec) 2,400MHz with 17-17-17 timings at 1.2V. Of course, a second pack can be purchased to double-up on capacity for the many motherboards offering four DIMM slots. It's a shame that faster speeds are not available right now, because the regular Predator runs up to 3,600MHz, and we note that the competition, namely G.Skill and Corsair, is able to run at 3,600MHz for their premium sets. HyperX doesn't provide an RGB configuration utility of its own. Rather, various effects are tuned from within the relevant motherboard LED application. At the time of writing, that means Aura Sync from Asus, Mystic Light from MSI, and RGB Fusion from Gigabyte. If you don't have any of these, the modules will run a factory preset RGB wave effect. Using the Predator as a base means the modules are chunky and well-put together. It's useful to know they're 42.2mm high, in case there are any potential mounting issues, and they're exactly 8mm thick. Price, however, is on the steeper side, as a 16GB (2x8GB) pack costs £225, compared to less than £200 for nominally similar packs from, say, Corsair and G.Skill. We used the HyperX RGB modules on an MSI X470 Gaming M7 AC motherboard, which recognised the modules immediately. Configuration of various effects is simple enough, but the exact level of flexibility will be down to the motherboard partner, not HyperX. A trick up the HyperX's sleeve, and claimed to be a world first, is having IR channels built into each module. The purpose is to enable a stick to 'talk' to a neighbouring stick and coordinate the required RGB colour scheme. In a series of four modules, for example, the module nearest the edge of the motherboard sets, if you excuse the pun, the tone, followed by the others in sequence. 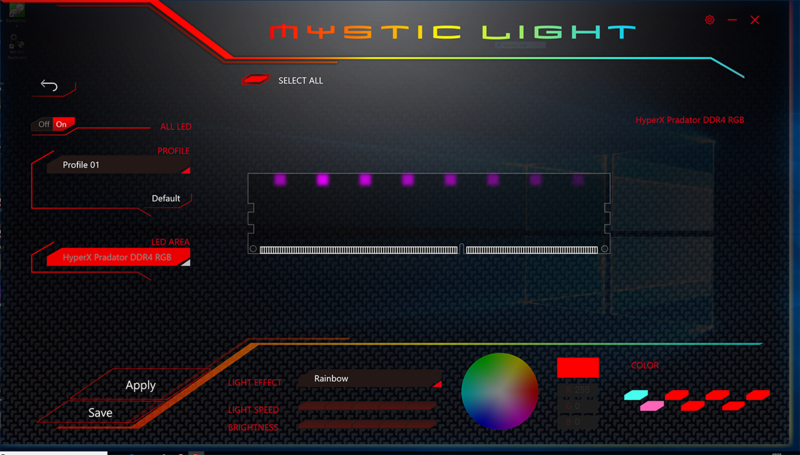 Why would you want this when a motherboard's software can set various effects and lighting schemes? Good question, and HyperX's answer, and the reason for including IR, is that motherboards do not have a consistent means by which they construct their trace layout. Asus does it one way, MSI another, and such deviation means that, under a few circumstances, the inter-module lighting effect can go awry. What you want, the company says, is a consistent means of running various effects across all motherboards, and having an IR sensor enables just that. Modules can be no further than 18mm apart, meaning that only the intervening slot can be left unpopulated, and we know that it does work because placing a piece of paper between the modules obstructs the communication and causes the modules to go out of sync. You can see a demonstration of just this over here. We also put it to the test, and the modules do override the Mystic Light programming if you put a piece of paper between them, blocking-off the IR sensors, so there needs to be a clear line of sight between modules. And why wouldn't there be, right? Up and running, the modules have a consistent output across the entire diffused lightbar. You cannot see the eight individual LEDs underneath, and the glow and intensity is as good as the best from the competition. Do bear in mind that, due to the Predator design, the light bar isn't as thick as, say, the G.Skill Trident Z RGB's, but there's still enough illumination for the modules to stand out. 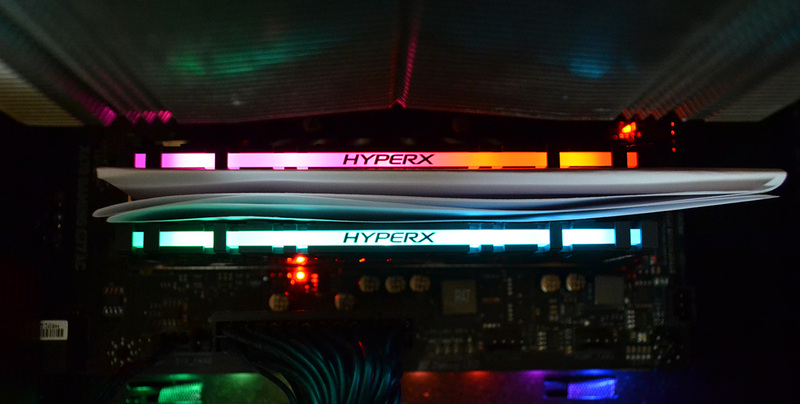 We'd probably still prefer it if HyperX cut away more of the upper heatsink to reveal more of the lightbar. The RGB LED lighting works well enough. Let's now run a few numbers before passing judgement.